levels and is the ideal choice for high availability, extreme environments or safety solutions. 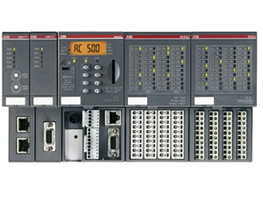 compact PLCs up to high end and safety PLCs. Our powerful flagship PLC with a wide range of performance, communications and I/O capabilities for industrial applications. The ideal choice for complex high speed machinery and networking solutions. This compact PLC offers flexible and economical configurations for your modern control system. The ideal choice for smaller applications. This safety PLC (SIL3, PL e) is designed for safety applications involved in factory or machinery automation area. The ideal choice to implement and manage complex safety solutions. Extreme Condition PLC variant of the AC500 platform with extended operating temperature, immunity to vibration and hazardous gases, use at high altitudes and in humid conditions.